Mr. Colón I just wanted to say thank you so much for convincing me to take your class. I cannot begin to tell you how it has changed me, I know you are probably laughing right now but it has. I felt like I was in a rut. It is finally nice to have done something for myself and to feel good about it. I just went down in couple sizes. I was shopping for new clothes yesterday. I am shocked that I did it. I am getting ridiculously annoying to my family and friends cause I am so excited but you know what I don't care for once. You all are so great and supportive which makes it a lot easier for me. I know it wasn't like I had to lose 100 pounds and everyone would ask me why am I doing this, I don't need to but the thing is I did. I needed to feel better about myself and now I do, so thanks!! I have been a student of Tong Dragon since February of 2014 (nearly six months at the time of this post). When I joined, I had no martial arts experience, but in a relatively short time, Mr. Colón and his staff have helped make it "my thing." The Bayville facility is large enough to accommodate big classes and it is always clean. As great as that is, the people at Tong Dragon, staff and fellow students, are what make this place special. Mr. Colón and the other instructors are fantastic motivators, pushing everyone to reach their individual bests. The student body is full of helpful, genuine people who are always happy to pass on what they have learned as well. It is definitely not a martial arts gym full of meatheads or problem characters like some of the other places I have heard about. Mr. Colón attracts good people to his gym because of the positive, professional vibe he puts out. The personal benefits I've received from training at Tong Dragon range from a higher fitness level to increased focus. But the technical aspects of learning a martial art like Muay Thai kickboxing have made me a happier person at home and work. The confidence gained from moving up ranks and mastering new techniques is what makes me want to remain a student for many years. Sifu,I completed my second year as a student at Tong Dragon Academy and provide the following comments on my experience during year two.A couple of new belts and armbands with different colors and new stripes for my BJJ belt.A deeper understanding of the Martial Arts and an appreciation for the strategy and techniques. Many more friends and shared experiences that will be remembered.Instructors who are professional, committed, knowledgeable, and student focused. Facilities, equipment, and website updated to remain relevant.Successful competitive fighters. Several seminars lead by accomplished Martial Artists which provided new experiences and horizons.Periodically classes pose physical and mental challenges to attend, however extreme satisfaction is always experienced at the conclusion. My commitment to the Martial Arts grew with time.The investment in money, time, and physical and mental effort are rewarded with large dividends of personal satisfaction. Thanks again for another wonderful year, I will report again at the end of year three.Well Done! Tong Dragon Mixed Martial Arts has been a part of our family for many years now...My son Michael has trained since a very young age and achieved his Black Belt. I too have trained and enjoy being a part of such an excellent school with great instructors. 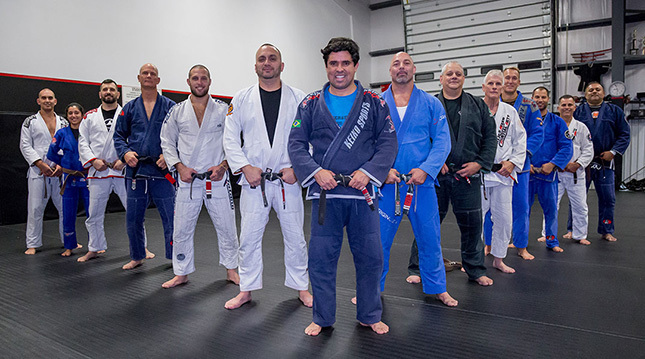 Mr Eric Colon is a great instructor that is very clear in his teaching along with all his instructors who are respectful to students of all ages and levels of skill. I would recommend Tong Dragon to anyone who may be interested in giving MMA a try. First, making the decision to train in the martial arts will change anyone’s life for the better, and there is nothing more important, especially for women and children, than learning self-defense and confidence. My husband had joined Tong Dragon about 6 months before I did, and seeing the positive changes in him both physically and emotionally since his first class made the decision easy for me to finally make it a part of my life too. All of the instructors at Tong Dragon, from the kids program to adult, are experienced, knowledgeable, friendly, and enjoy what they do, and most importantly, you’ll feel truly part of a team and family, the hallmark of a great martial arts academy. The physical and mental benefits since joining Tong Dragon are numerous, and I’ll be happy to call it my family’s home away from home for many years. Anthony is a very bright student.His academic skills are great due to his ability to recognize letters, shapes, colors and numbers.His motor skills can be improved by coloring, cutting and practicing pencil use at home.His martial arts has improved his patience in the classroom and I believe he will easily transition into the pre-k class. As a police officer and a defensive tactics instructor I am faced with the fact that I will be involved with physical confrontations.In addition I have the responsibility to instruct other officers in this field.Submission grappling gives law enforcement officers the ability to control situations that go to the ground.Studies have shown a large percentage of physical confrontations involving law enforcement,namely arrest situations, and go to the ground.Tong Dragon has provided me with the techniques, endurance and mindset to win the confrontation.I would recommend this training to all law enforcement. We enrolled our son at Tong Dragon when he was 4 years old. Beginning in the Little Dragons class, and now having worked his way up to the Kids Advanced class, he has had an amazing experience throughout. Mr. Colon and his staff are engaging, patient, supportive, and fun with all of their students. They take the time to recognize each child's needs and give an extra push or pep talk whenever it's needed. Our son has always left class feeling accomplished and excited for the next class. MMA teaches him respect, responsibility, and wonderful self defense and safety skills. We are extremely pleased with the school and are eager to watch our son continue to grow. Sir, Since joining Tong Dragon, I have had nothing but great experiences and gains. Tong Dragon offers every option for training, self defense, cardio and strength and conditioning.I take advantage of all the classes offered as well as supplementing with the Kettlebell training.As a female, the important things for me are: a safe and friendly environment, learning self defense, challenging workouts, staying in shape and the ability to compete. Tong Dragon has become a second home and family for me. Everyone, including staff and students, make it a fun place to train and keeps me coming back. I feel more empowered having learned self defense, which has also boosted my confidence.The cardio workout is insane and definitely better than anything I could ever do on my own.My cardio endurance has increased tremendously and keeps getting better. Until Kettlebells was offered, I always felt as though I was missing a part of my workout and that I should find time to go to the gym.Now that it is offered at the school, I feel like I can accomplish it all at one place.I have lost 20 lbs, 9 inches and transformed my body.I am completely addicted and tell everyone about my passion for Martial Arts and Kettlebell training. Thank you to everyone at Tong Dragon for making it such a great place to train.